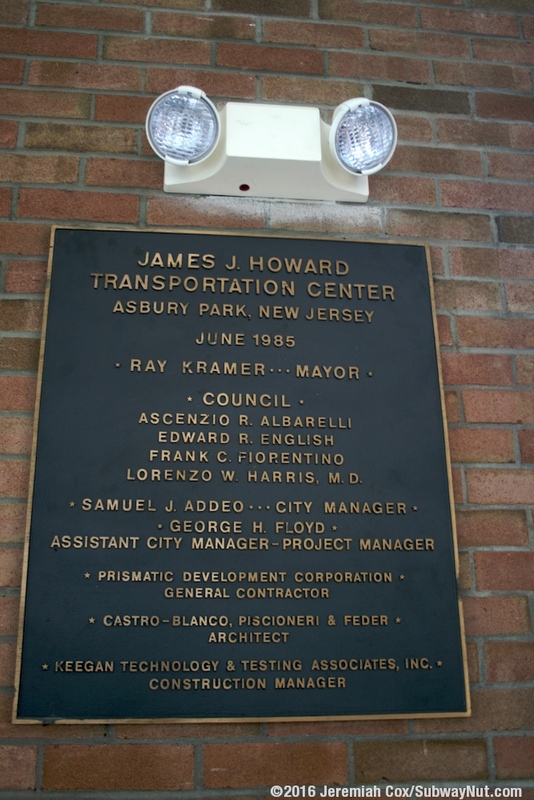 Asbury Park is served by the James J. Howard Transportation Center dedicated in June 1985. 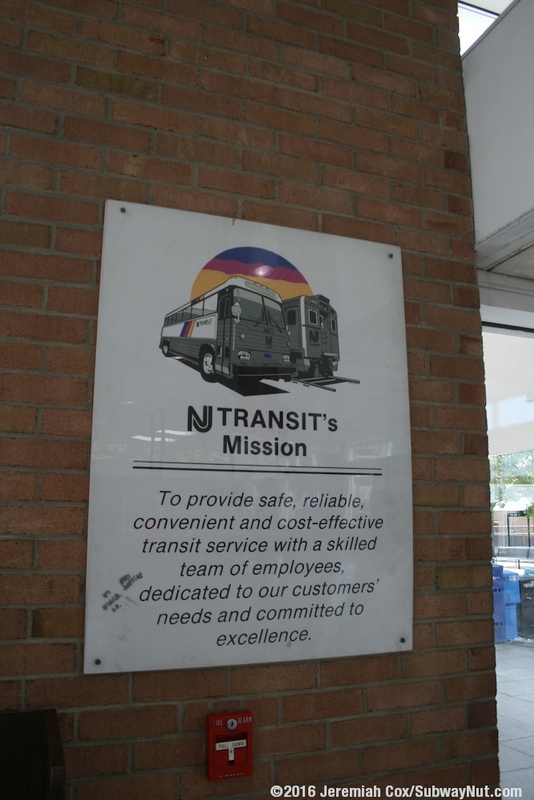 This transportation center is the main bus and rail hub of the Jersey Shore with 5 New Jersey Transit buses connecting at the station (other stops have just one or two bus connections, if any). 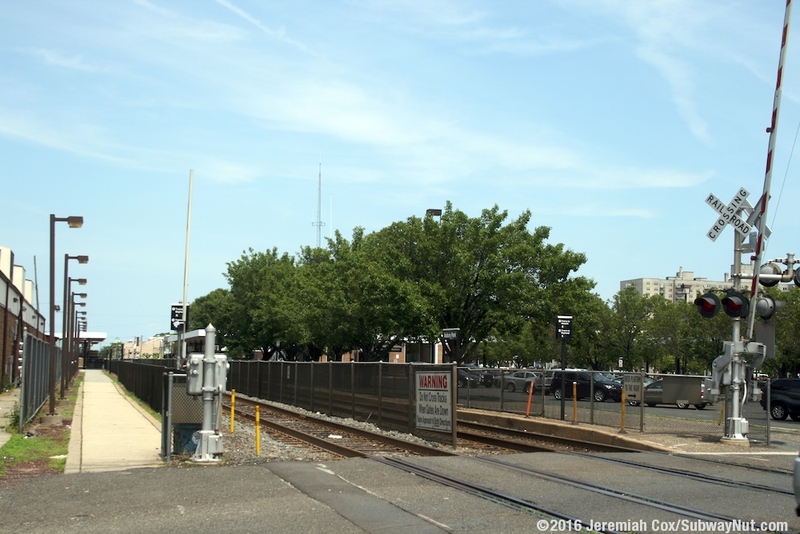 Bus route 317 even runs all the way to Camden and Philadelphia (a trip that takes almost 4 hours and costs $22.50) with the bus not curving away from the coast until Point Pleasant Beach. 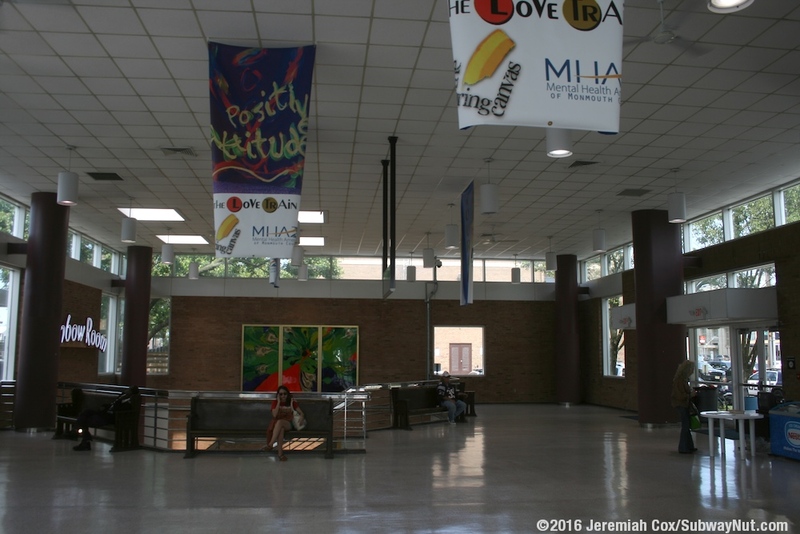 The modern transportation center is a brick building with a line of high widows above the tops of the walls holding up the flat station roof. This resembles an AmStation. 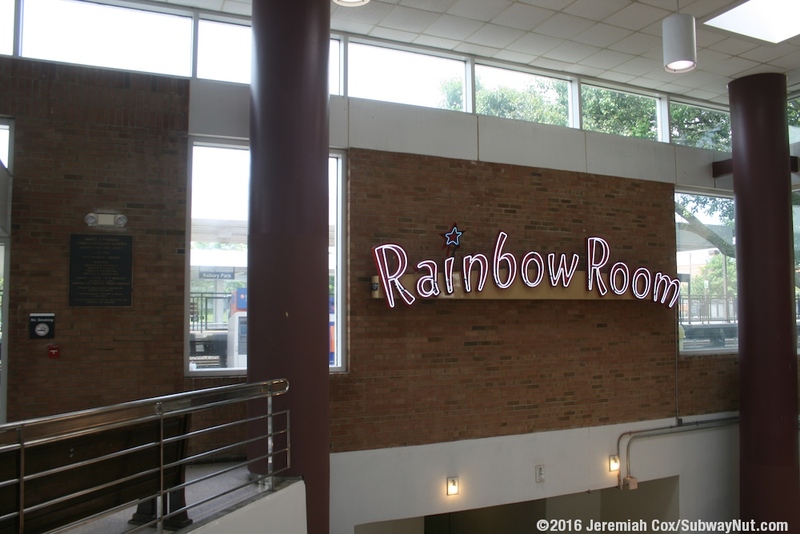 Inside is an airy waiting room with not much seating, just some wooden benches along the walls. 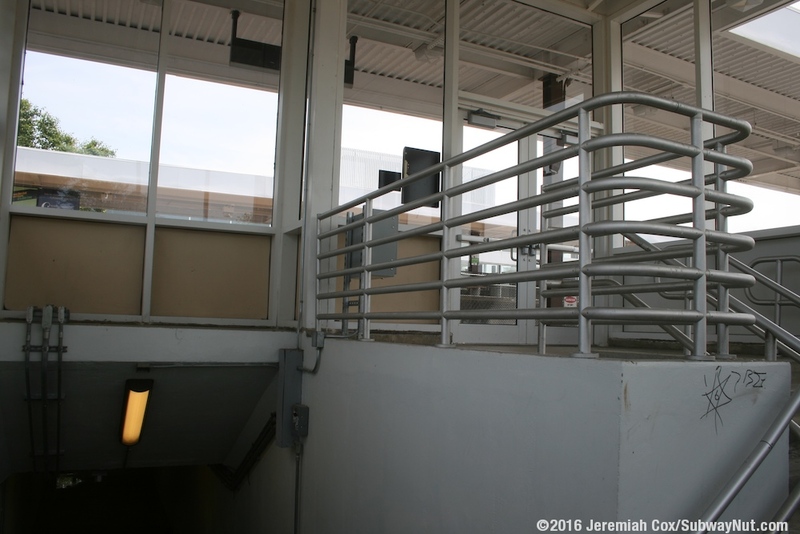 An interior staircase leads down to a tunnel under the tracks for southbound trains. 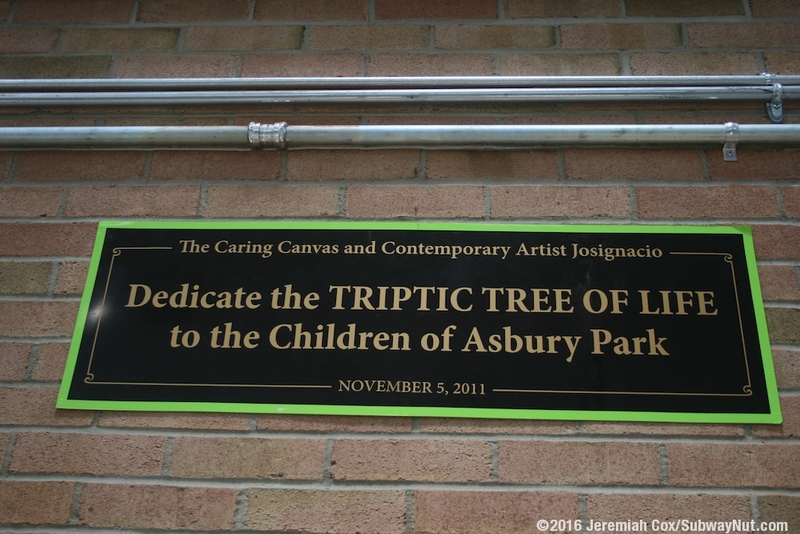 Above the entrance to the tunnel is some unique artwork added later: The triptic Tree of Life by the Caring Canvas and contemporary artist Josignacio dedicated November 5, 2011, and the historic neon sign for the Rainbow Room hotel (demolished in 2001) that was added and is still lit-up at all times and was added on Sunday June 3, 2012. 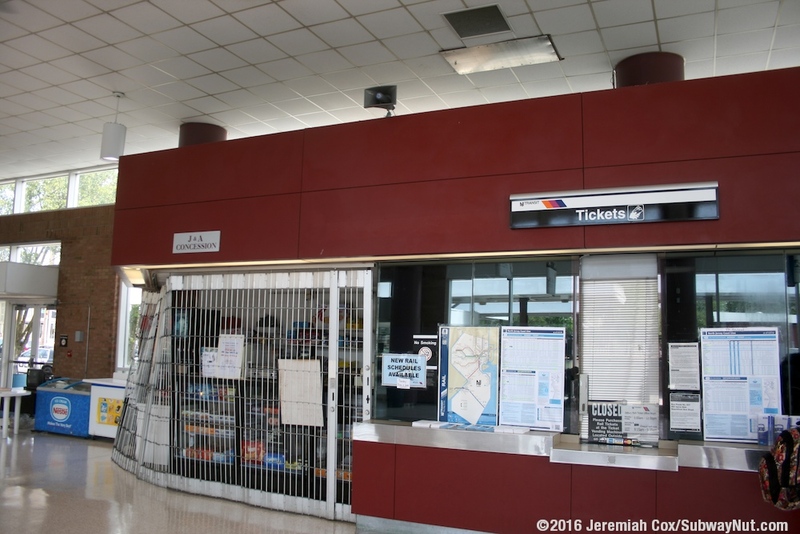 There is also a ticket office (open for one Weekday AM shift), and a concession/newsstand. For trains the station has two high-level platforms. 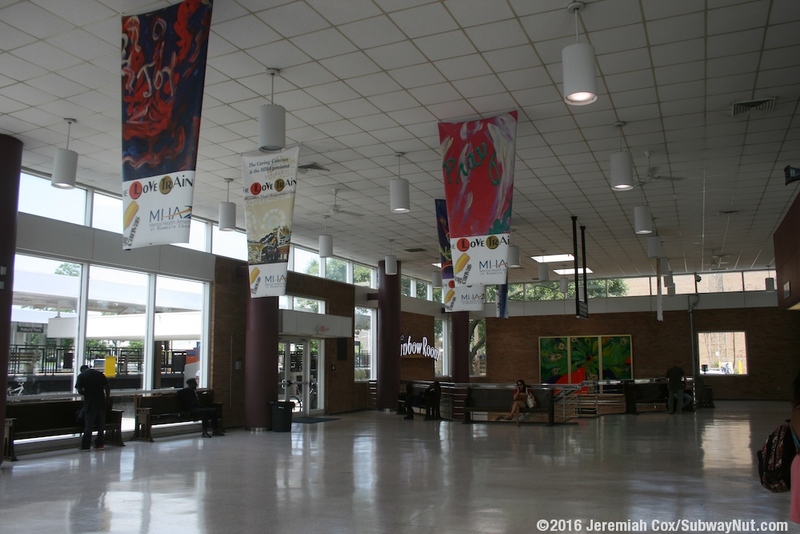 These high-level platforms were clearly added after the transportation center was built. 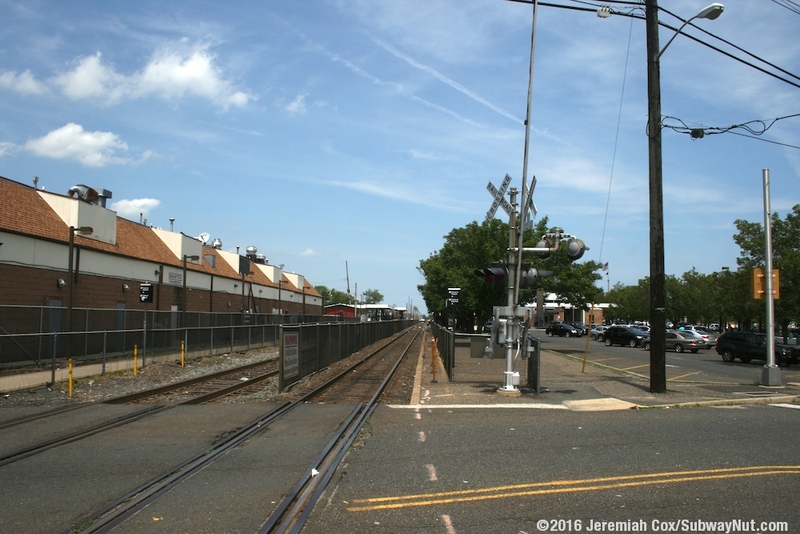 The evidence is the fact the yellow line of a longer low-level platform is still visible along portions of the sidewalks along the tracks that connect the grade-crossings of Bangs Avenue north of the platforms and Springwood Avenue to the south. Finally the platforms are offset from each other. The southbound platform that can accommodate about 5 cars. 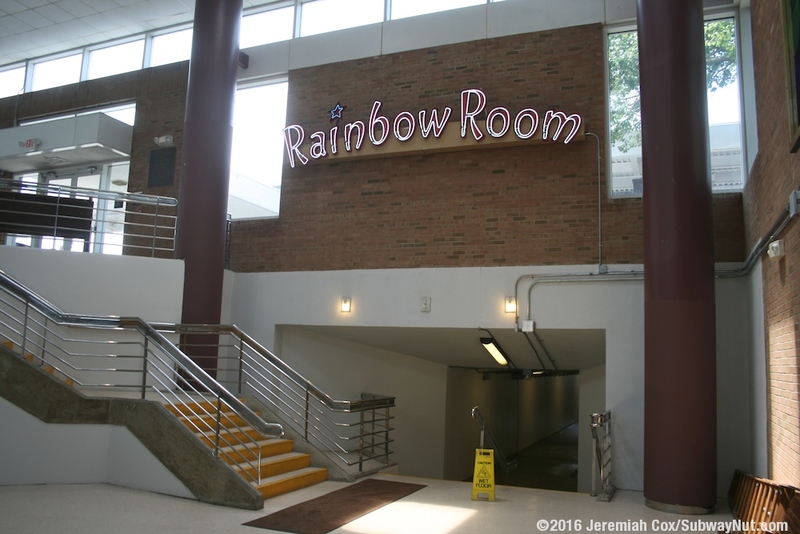 It begins just north of the portal of the staircase that leads up from the end of the underpass. This staircase is in a glass enclosure (with doors). 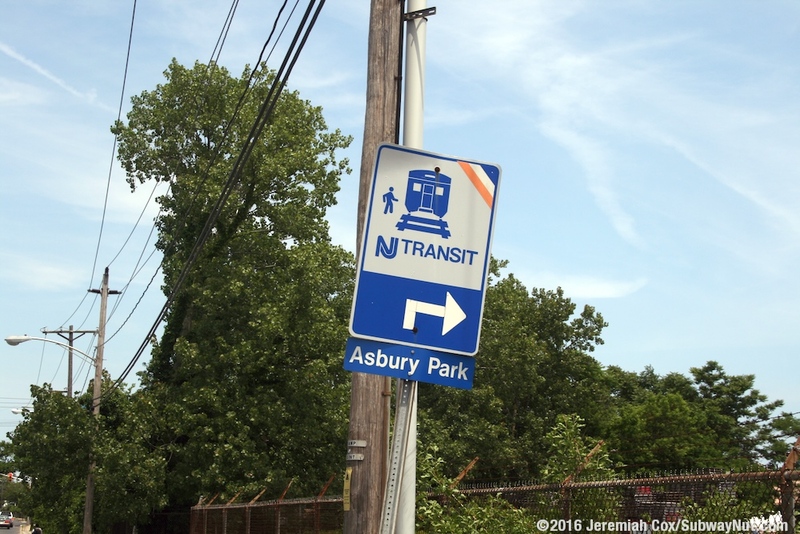 Lettering says Tunnel to Asbury Park Downtown & Boardwalk and that the Boardwalk and Ocean are a 12 minute walk away. 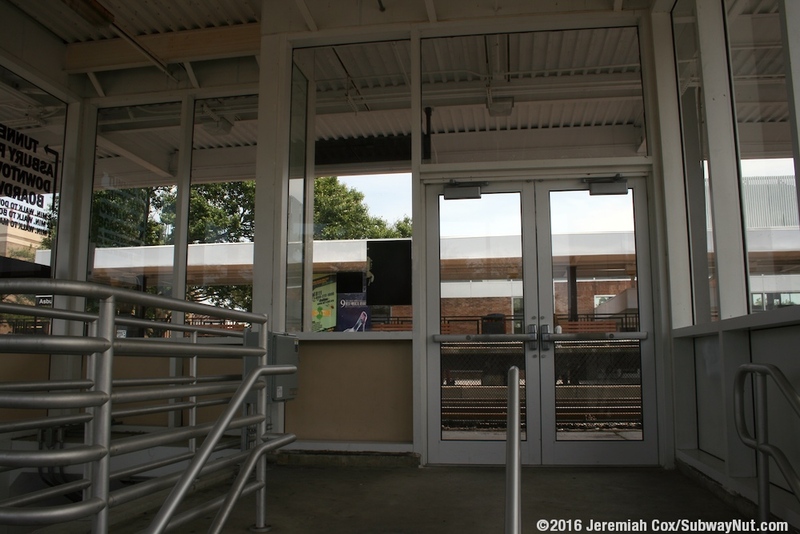 The enclosure holds up a small covered area at track level with a white roof that ends when the platform begins. 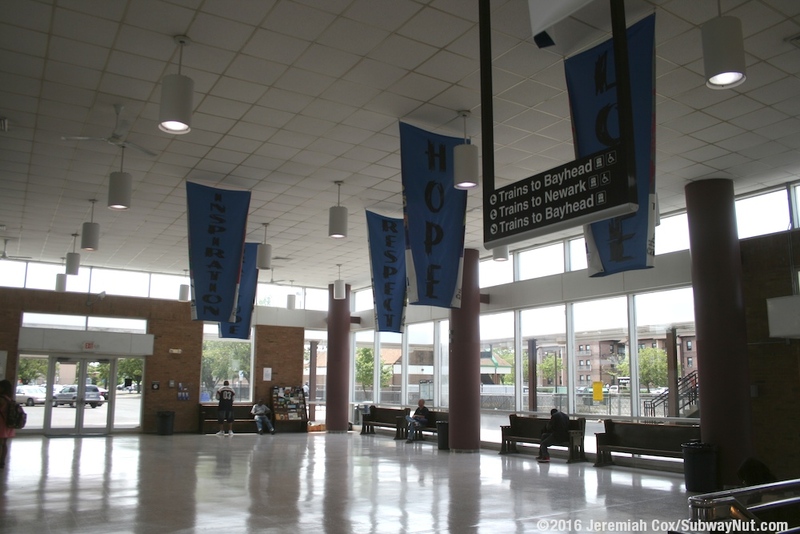 The end of the roof facing the platform has a stylized lettering (blue letters on black circles) saying Welcome to Asbury Park. 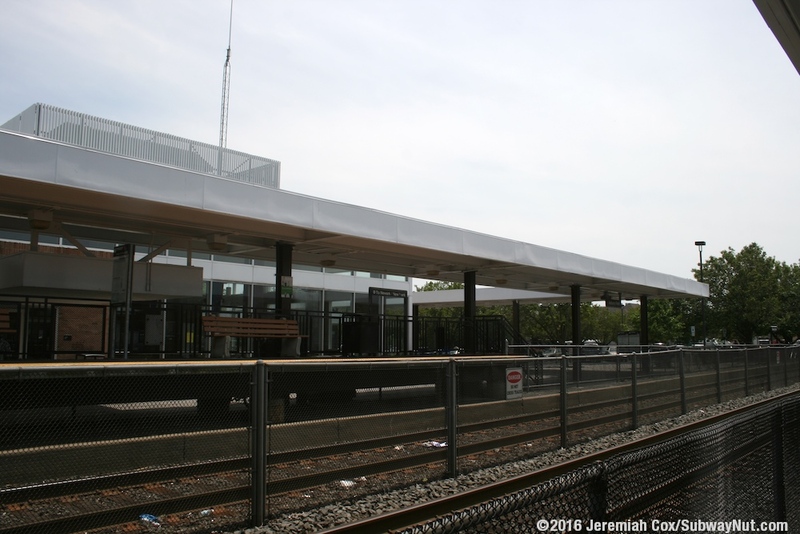 Otherwise the northbound platform has another car-length canopy at it's northern end (in the same white boxy style) where the ADA ramp leads to Bangs Avenue and the accessible connection between the platforms via the grade-crossing. 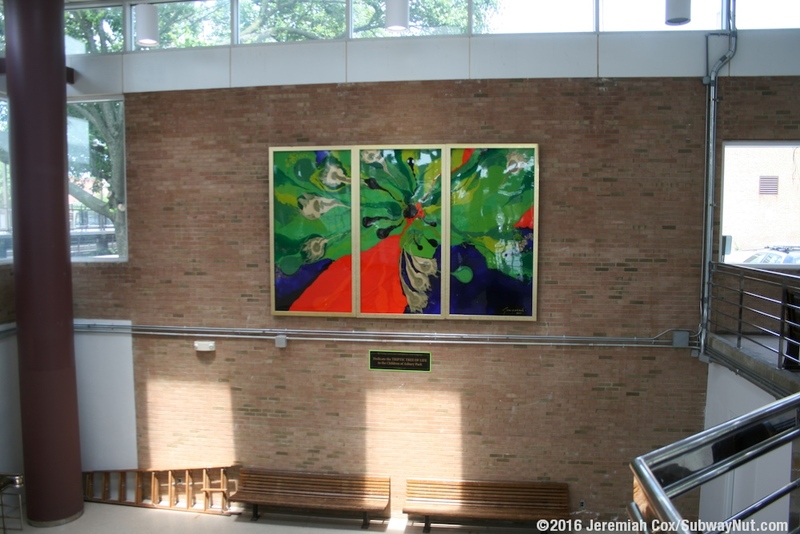 The northbound platform is on the side of the transportation center. 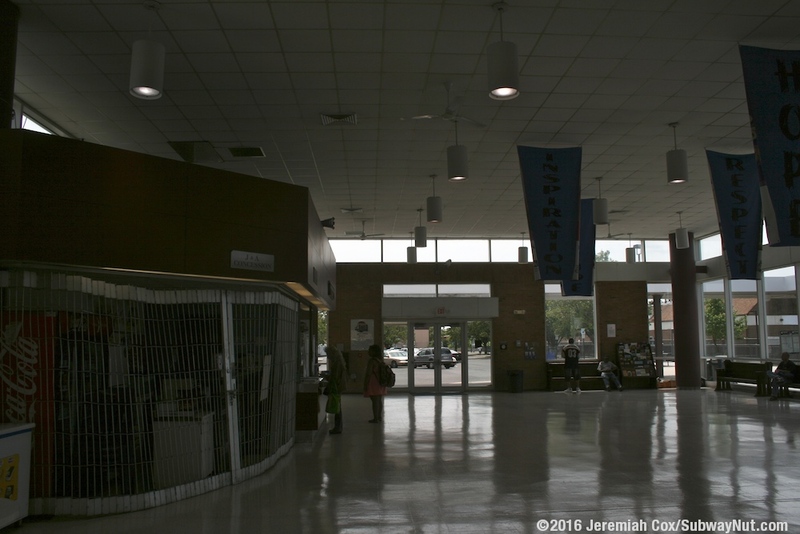 A very short covered walkway leads from the building to the platform. The platform is canopied for the southern half of it's length. 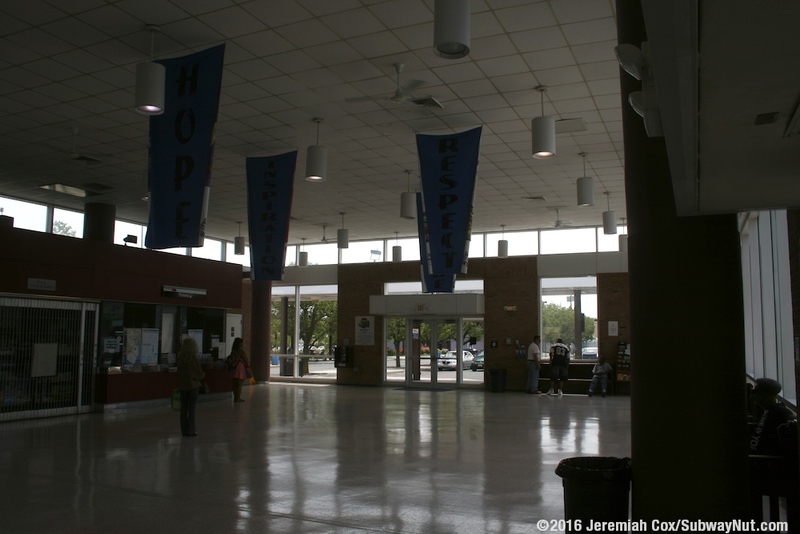 Further walkways lead from the southern side of the transit center to the bus loop that is located in an island plaza with plenty of greenery surrounding the driveway that serves it. Buses have their own canopy (their are 3 sawtooth bays) in the same style as those on the rail platforms. Parking is minimal. 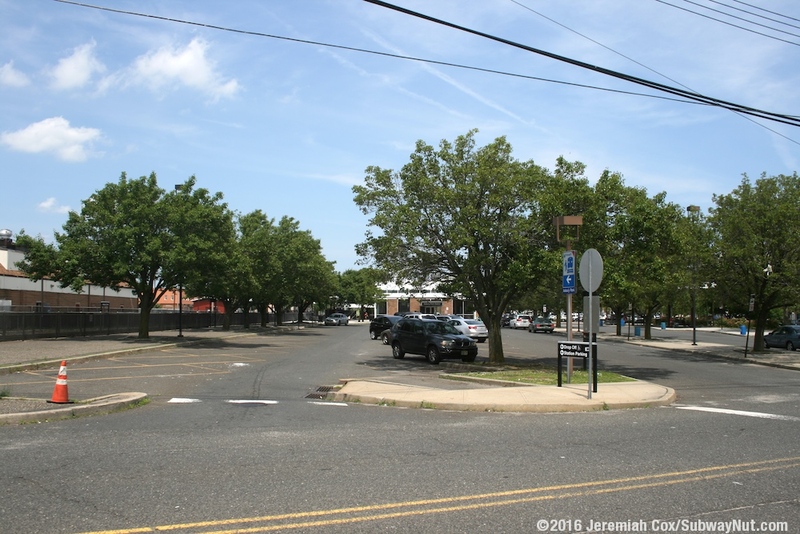 There is just a small metered lot with 40 spaces between the rail tracks, the bus loop and Springwood Avenue, another small lot with 29 spaces is located along the southbound platform, just north of the lot for an industrial user. 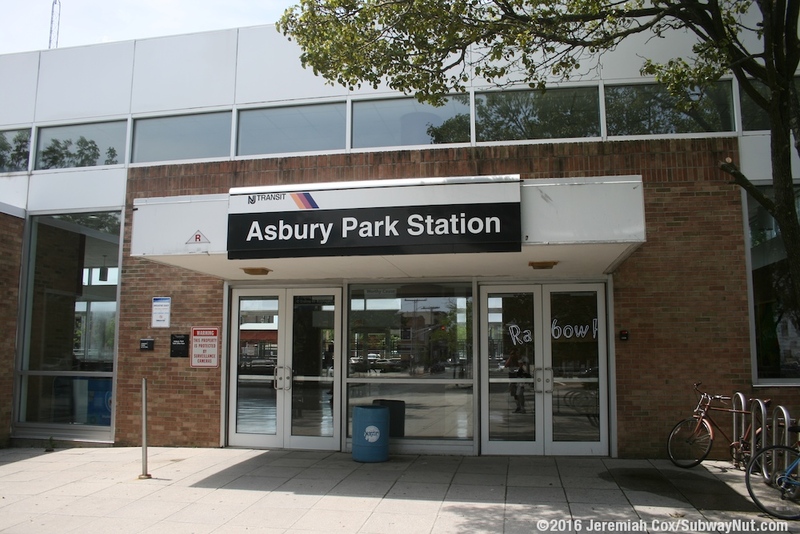 The Asbury Park City Hall and Courthouse are located just north of the transit center along the train station platforms.